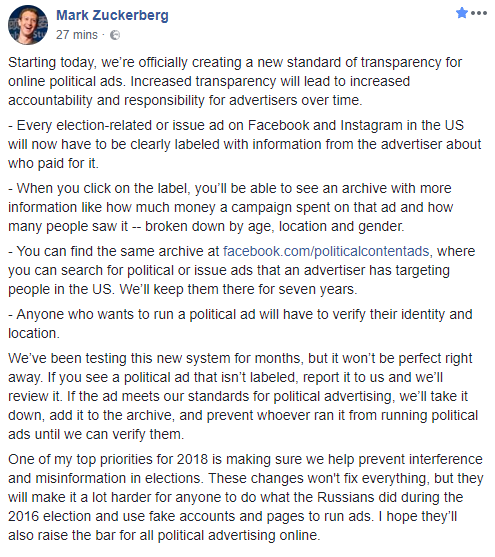 Facebook CEO in a post made known some interesting feature which will help make facebook a fake political ads less zone. Mark zuckerberg revealed that facebook will label political ads and even go to the extent of making public the analytics report of the Ads such as how much being paid and how many people reached broken down to gender. The motive is to boycott the fake accounts and ads which were used during a Russian election. Mark claims the feature has been tested for month , as we told you here. Yes, when you see an Ad which is not labelled, report it. Facebook will review it. If it does meet requirement, facebook will take it down. That what Zuck was trying to say, unless he was being sarcastic, as it is social media where he is free to make such mistakes with nobody calling him to order. Starting today, we’re officially creating a new standard of transparency for online political ads. Increased transparency will lead to increased accountability and responsibility for advertisers over time. – Every election-related or issue ad on Facebook and Instagram in the US will now have to be clearly labeled with information from the advertiser about who paid for it. – When you click on the label, you’ll be able to see an archive with more information like how much money a campaign spent on that ad and how many people saw it — broken down by age, location and gender. – You can find the same archive at https://web.facebook.com/politicalcontentads, where you can search for political or issue ads that an advertiser has targeting people in the US. We’ll keep them there for seven years. – Anyone who wants to run a political ad will have to verify their identity and location. We’ve been testing this new system for months, but it won’t be perfect right away. If you see a political ad that isn’t labeled, report it to us and we’ll review it. If the ad meets our standards for political advertising, we’ll take it down, add it to the archive, and prevent whoever ran it from running political ads until we can verify them. One of my top priorities for 2018 is making sure we help prevent interference and misinformation in elections. These changes won’t fix everything, but they will make it a lot harder for anyone to do what the Russians did during the 2016 election and use fake accounts and pages to run ads. I hope they’ll also raise the bar for all political advertising online. This is Bad news or Good news but it depends on how you want to take it. Latest update from Adobe reveals that next major Abobe creative cloud release won’t support old Operating systems. The company looks to focus on modern OSes in order to take advantage of their features. Sorry, if that was bad news for you. Adobe won’t support Windows 8.1, Windows 10 v1511 and Windows 10 v1607. Only Windows 10 v1709 or higher gets the deal. Microsoft stopped windows 8.1 general support on January 2018. Windows 7 gets a preferential treatment as Adobe CC next release will still be supported on it. Meanwhile the makers of the OS stopped support way back 2015. Good news, I think. Do we downgrade our Windows version if we’re running the unsupported Windows version ? Likewise, Adobe latest CC release won’t be supported on MAC OS v10.11. Its quite understandable, Apple just announced Mac OS v10.14 for the fall of 2018. And it has always being Adobe’s policy to support only the three most recent Mac OS. This update applies to all Adobe CC application including Adobe audio and video tools. Don’t take it hard on Adobe, they have a good reason why would force the update ? After working with Microsoft insiders since last month on “Your Phone” app, an application that syncs your Android phone with Windows PC, Microsoft has unveiled a public version of Microsoft “Your Phone” app. Your Phone app is only available to Windows 10 users who have April 2018 Windows update. You can get it on Microsoft store for 10mb. Another requirement to get the feature working is an Android phone running Andriod 7.0 and above. Your phone app helps you share stuffs between your smartphone and PC on the fly without USB. Currently, you can only drag and drop photos to PC after you’ve setup remote connections. Microsoft is hoping to add new feature such as text message and notification sync, in order to mirror your basic phone activities on PC. Your Phone app would have been a feature that will come alongside Microsoft’s Redstone 5 windows 10 upgrade. But, fortunately, you got it earlier. Its unclear what plans Microsoft towards iOS version of your phone app.